Even the most careful planning sometimes cannot mitigate human error. A week ago, a photograph of the World Cup Security Center showing the WiFi password on a whiteboard in the background was published on the internet and immediately retweeted numerous times. 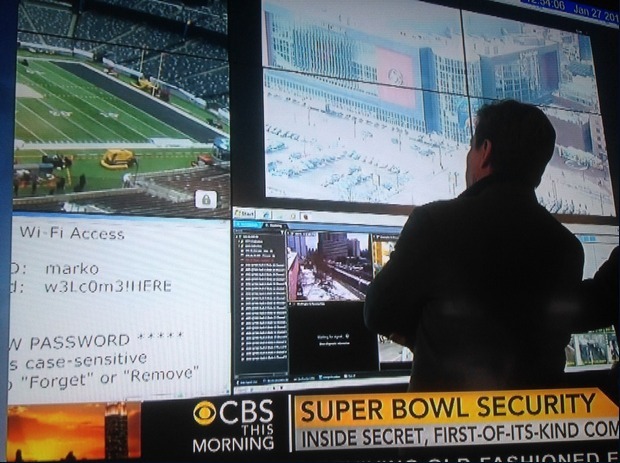 Last February, during the Super Bowl XLVIII pre-game show, the Super Bowl security headquarters was shown on a television broadcast along with the stadium's internal WiFi login credentials. These so-called "epic fails" are highly publicized examples of regrettable mistakes that every human on the planet is familiar with - because we all make them. Maybe not at that scale; but I dare say, that no one at FIFA or the NFL intentionally set out to expose themselves or their organization to danger. So let's stop giggling at these public slip ups and talk about our collective failure at securing our own passwords and other data. Think about your smartphone in regards to the data that is on it. Slipped absentmindedly into the back pocket of your jeans, this little device (and we've heard this before...) has more computing power than NASA did back in 1969 when it sent two astronauts to the moon. You have a lot to lose if it gets stolen or is attacked by malware. Make a list of all it contains. It goes way beyond passwords, but we'll start there. Passwords - We have written before about creating strong passwords and keeping them safe from nosy neighbors. Login credentials - What happens when a thief gains access to your bank account login and password? Private SMS messages - Do I have to point out why you don't want texts to become public? Hint: Selfies. Private and work-related emails - Your personal communications; your company's sensitive materials - in the wrong hands. Meditate on that for a moment. Personal and work-related documents - same as above. Apps with personal information stored - Apps store info like location, gender identifiers, health info, and more. You want a criminal to know this about you? Photos - Precious memories that would make you cry if you lost them. Those Selfies might make you cry too. Music & Movies - You paid good money building up your Celine Dion collection. You wouldn't want to lose it. This little device is basically your PC and more, and it's often carelessly stuffed into your pocket or left exposed on the cafe table. Out of 1 billion active Android users, only a tiny percentage have chosen to proactively protect this valuable machine and their data that is stored on it. It's time to change that. It's time to apply the knowledge and concern you have for the security of your laptop or desktop PC to your smartphone. And avoid an Epic Fail. It's time for you to install avast! Mobile Security & Anti-theft. Get it from the Google Play store for free. Since the World Cup is going on (is there a better reason?) :) AVAST is offering a special deal on avast! Premium Mobile Security now until the end of the games on July 13th. 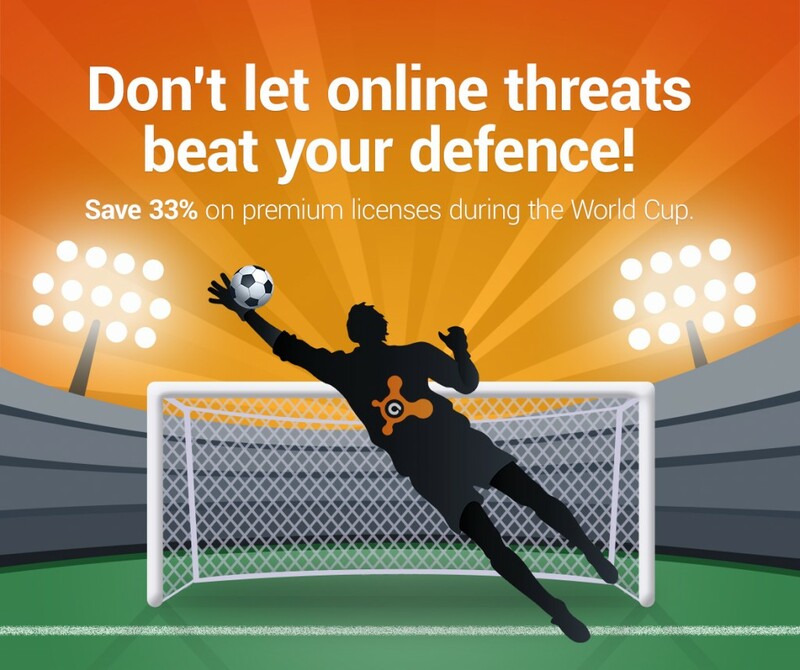 Get a 1-year license for 33% off the regular price. Protection from thieves with Geo-Fencing: Phone locks, lets lose with an obnoxious siren, and sends the phone's location to your PC or a buddy when outside of a set perimeter like a cafe. Catch a thief: Locks you phone and takes a "theftie" of the scumbag who stole your phone. Find out what the ads are tracking: Little brothers aren't the only ones wanting to know what you're doing. Find out the full details of ads tracking systems. US shoppers, visit the US store to purchase in dollars. UK shoppers, visit the Great Britain store to purchase in pounds. English speakers in the EU, visit the EU store to purchase in euros.